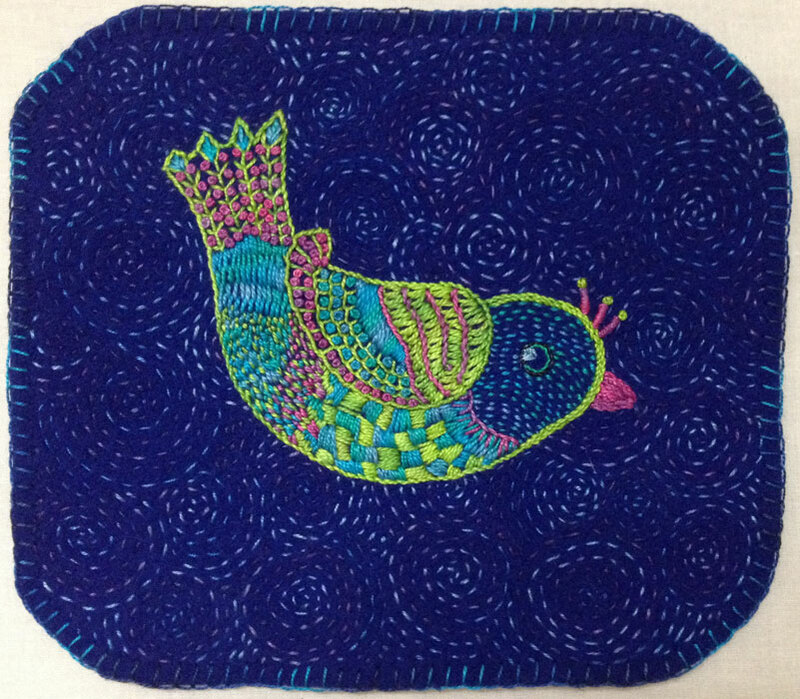 In 13 steps make a free-stitched bird like this. Woolly Bird is hand embroidered on wool using techniques from my new book Joyful Stitching: Transform Fabric with Improvisational Embroidery. You can use any colors you like. We are winging it! The written and illustrated directions for Woolly Bird, are also found in Free-Form Hand Embroidery on Wool along with 4 other projects stitched on wool. Click here to purchase a kit of the wool and threads needed. Or use the following items you already have in your stash. Print out this PDF of the Woolly Bird Pattern or draw your own bird shape. Use a Size 8 pearl cotton thread color that contrasts with the background fabric and in a color you won’t be using to outline the bird. Stitch with a size 3 or 4 embroidery needle. If you don’t like the shape you’ve stitched, rip out the stitches and start again. Use a Size 8 pearl cotton and size 3 or 4 embroidery needle. Stitch an Outline Stitch around the top and front of the wing following the lines of the Running Stitch. Stitch the wing tip feathers with a Blanket Stitch. Vary the width of the Blanket Stitch on the wing tip so the feathers appear to get longer at the tip. 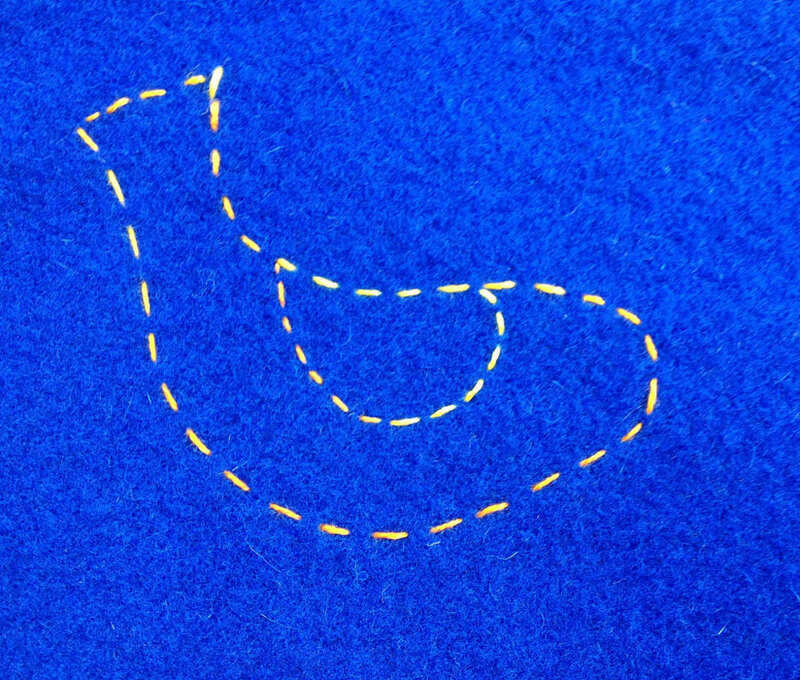 Stitch an Outline Stitch around the head and body of the bird following the lines of the Running Stitch. Stitch a few long Blanket Stitches on the end of the tail for tail feathers. 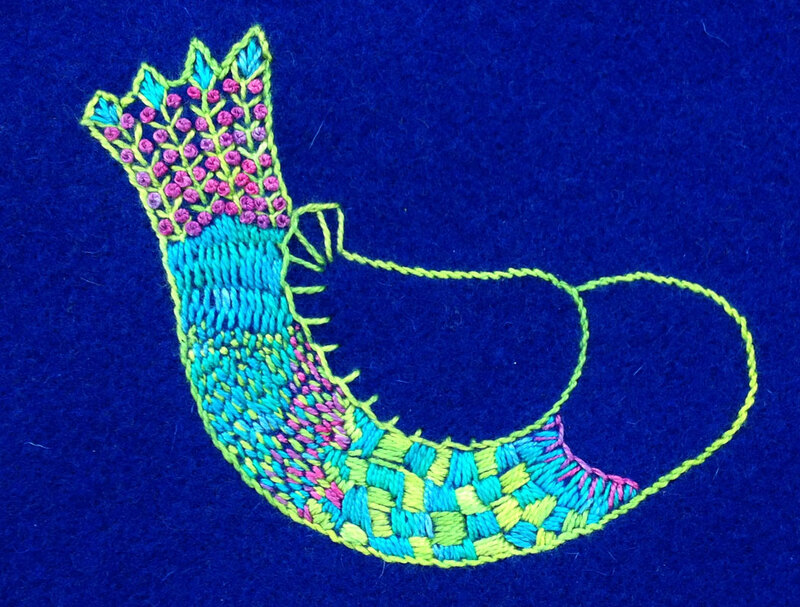 Remove the Running Stitches to reveal the neatly outlined shape of the bird. Use Size 8 pearl cotton threads in different colorways and size 3 or 4 embroidery needles to make the neck ring. Stitch a Blanket Stitch to make the arc of the neck. 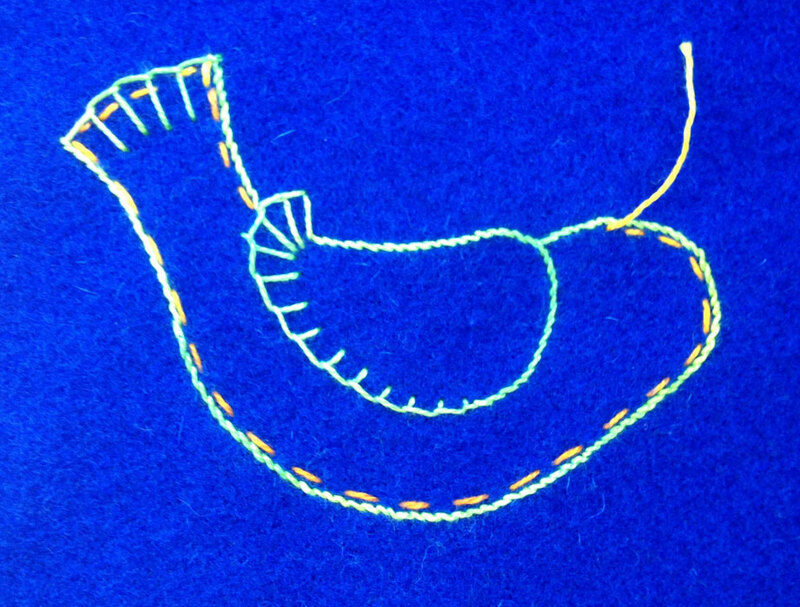 Stitch a few Straight Stitches in a different thread color between the tines of the Blanket Stitch. Select two different Size 8 pearl cotton thread colors and use a size 3 or 4 embroidery needle to make the belly of the bird. Stitch a row of Satin Stitches down the lower edge of the neck ring to fill it in. Stitch Satin Stitches that measure about ¼” long from the neck to a midway point on the lower wing. 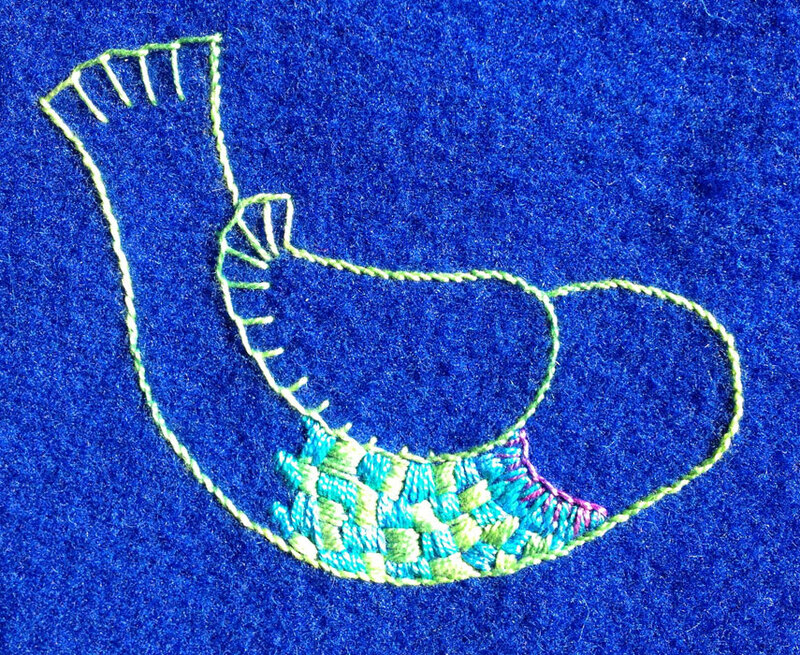 Alternate the thread colors and lay the Satin Stitches perpendicular to the opposite color to fill in the bird belly. 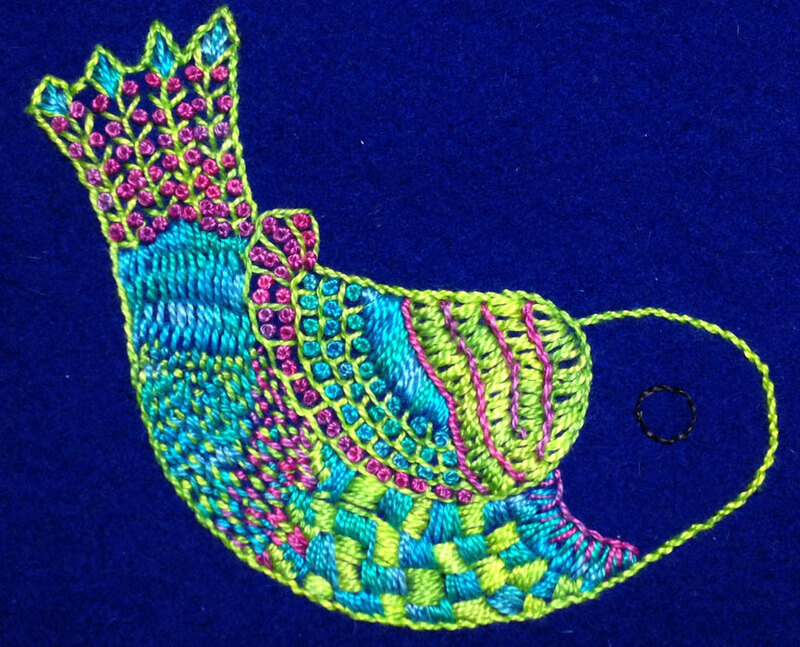 This bird has 7 vertical rows of Satin Stitches Your bird belly size may vary. Use Size 8 pearl cotton threads in different colorways and size 3 or 4 embroidery needles. 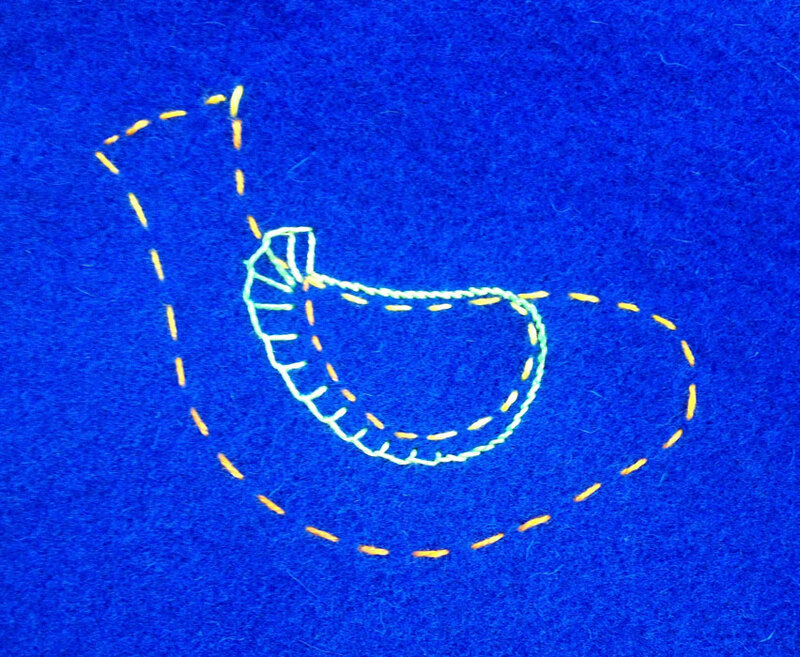 Stitch Straight Stitches in parallel lines from the belly up to the tail area of the bird. Mix the thread colors for more interest. 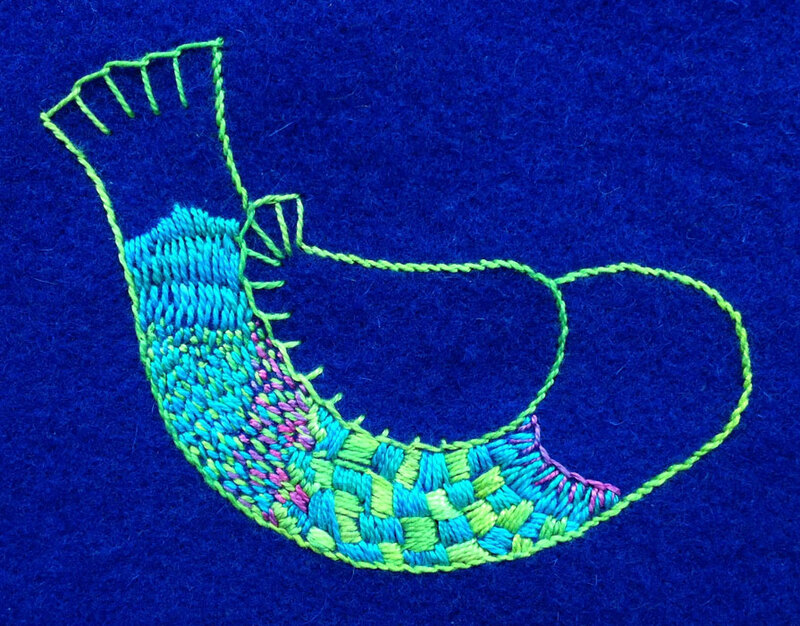 Stitch 4 rows of Fern Stitches from the tip of the tail feathers back to the Straight Stitches on the bird’s body. Add French Knots between the spars of the Fern Stitch. 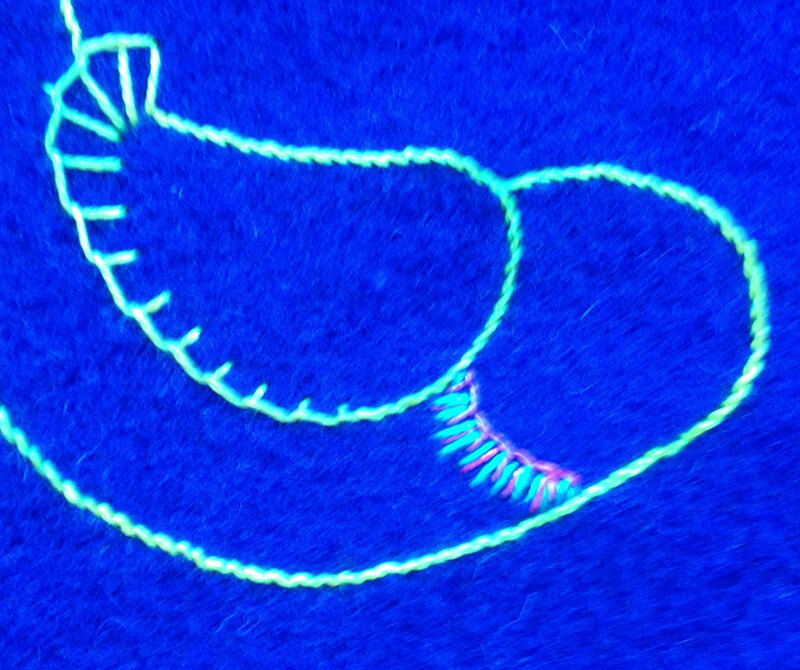 Fill in the tail points with Straight Stitches. 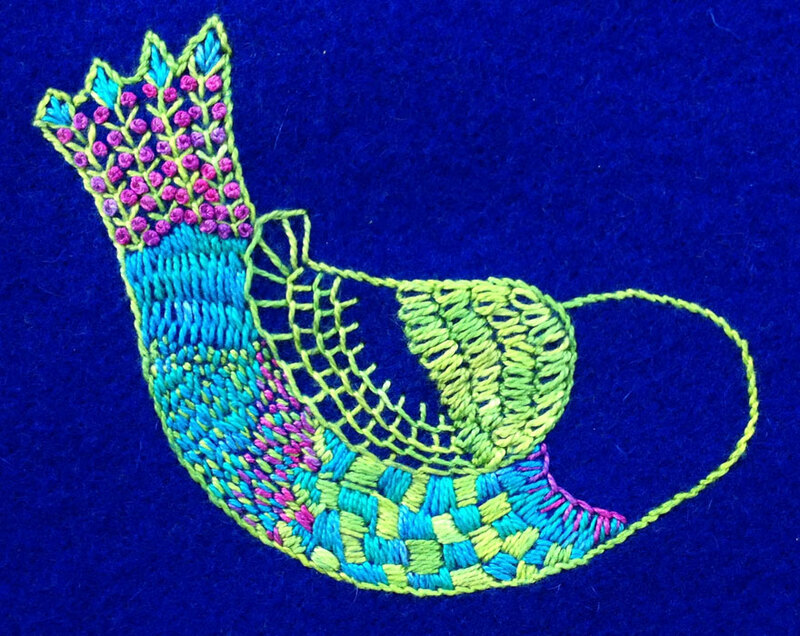 Use a Size 8 pearl cotton thread and size 3 or 4 embroidery needle. Stitch four rows of the Lazy Daisy Stitch to make the wing cap. Stitch three rows of the Blanket Stitch to add more feathers to the wing tips. Place the Blanket Stitches so they touch the previous rows and make little boxes. Stitch the Outline Stitch between the rows of Lazy Daisy Stitches on the wing cap. Fill in the Blanket Stitches on the wing tips with French Knots. Stitch Satin Stitches between the wing cap and wing tip. 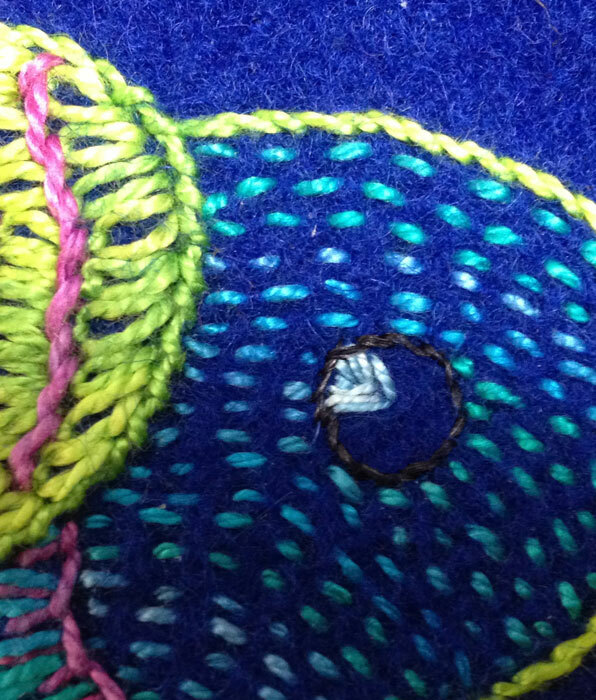 Stitch a ½” diameter circle for the bird’s outer eye (black thread is recommended) using the Outline Stitch. 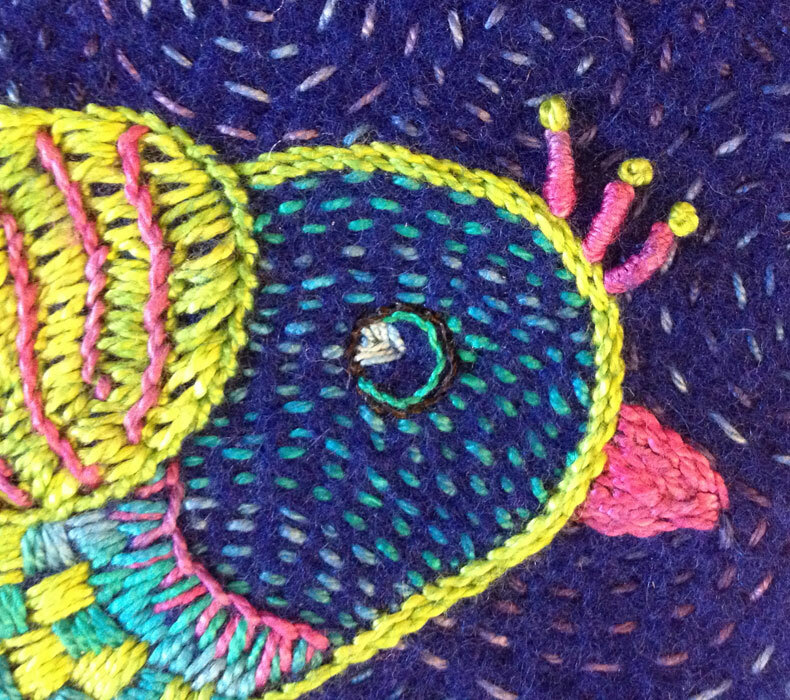 Use a light colored thread to make a triangle with closely packed Satin Stitches for the highlight in the bird’s eye. 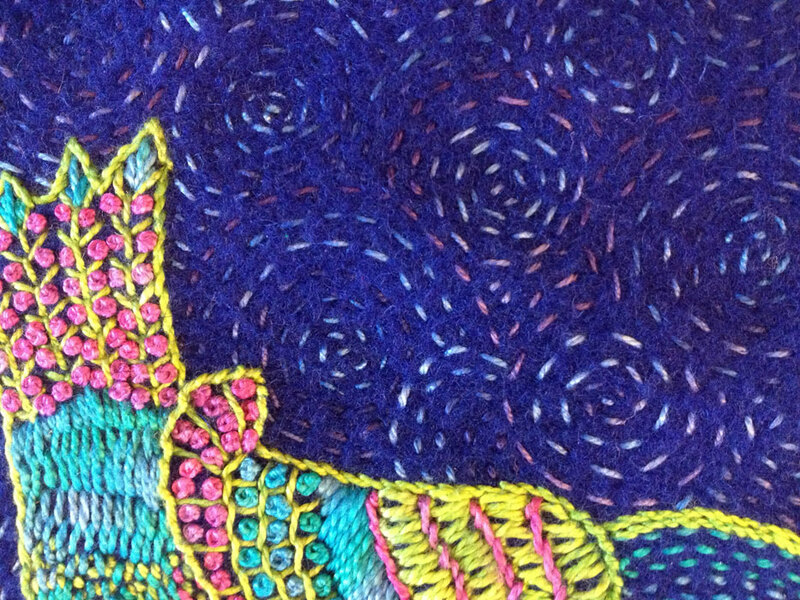 Fill in the eye with Satin Stitches using a darker thread unless the wool color you are using is dark like this example. Stitch Running Stitches across the head to fill in the bird’s head. Stitch another row of Outline Stitches inside the bird’s eye and around the outside edge of the bird’s head to make them stand out if necessary. Stitch Outline Stitches in tight rows to make a triangle for the beak. Stitch three Bullion Knots with French Knots at the tip across the bird’s head to make the crest. Stitch the Blanket Stitches around the edges of the wool. Enjoy your new Woolly Bird!